Create a directed graph, allowing multiple edges and self loops, from a unix mailbox. The nodes are email addresses with links that point from the sender to the receivers. The edge data is a Python email.Message object which contains all of the email message data. This example shows the power of DiGraph to hold edge data of arbitrary Python objects (in this case a list of email messages). From: bob@gov To: ted@com Subject: Re: Graph package in Python? 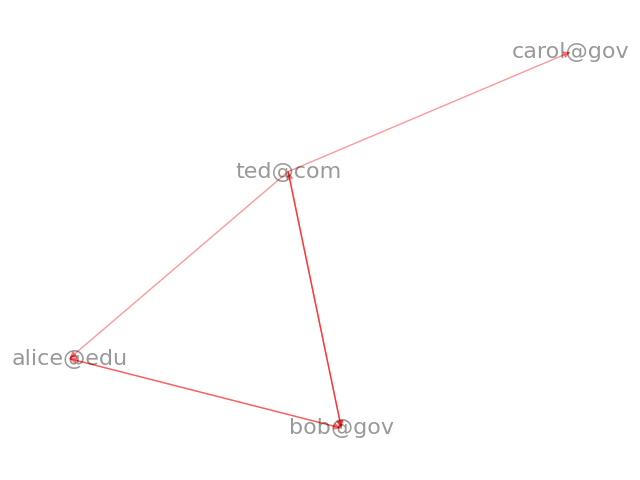 From: ted@com To: bob@gov Subject: Graph package in Python? From: ted@com To: bob@gov Subject: get together for lunch to discuss Networks? From: ted@com To: carol@gov Subject: get together for lunch to discuss Networks? From: ted@com To: alice@edu Subject: get together for lunch to discuss Networks?